Next month Gravitas Ventures unveils the intriguing and dark mystery thriller from Francisco Orvañanos BACKGAMMON. Based off the novella from R.B. Russell the film involves a young man on a weekend retreat who falls in love with a mysterious woman. What’s even more confusing is her ex boyfriend may not have left them alone to experience their new joy. This is a minimal description of what’s to expect as you will see in the trailer ahead. 3:1 will place the film in theaters while Gravitas is handling the digital release. It will be available on March 11th. Part psychological sexual thriller and part classic mystery, Backgammon explores sexual tension, danger and mind games between a group of college students during a getaway in a country mansion. When Andrew invites Lucian and his girlfriend Elizabeth for a weekend vacation, they don’t expect Andrew’s sister Miranda and her Baudelaire-obsessed boyfriend Gerald to show up as well. Overwhelmed by Gerald’s antics and the constant irritating horseplay with Miranda, Andrew and Elizabeth split. Lucian, however, decides to stay, as a simmering, sexual tension develops between him and the flighty, flirtatious Miranda. When Gerald explodes after losing everything during an alcohol-fueled poker game with Lucian, Miranda finally gives him the boot. But as she and Lucian begin to dance around each other, their surroundings show threatening signs that Gerald may never have left. 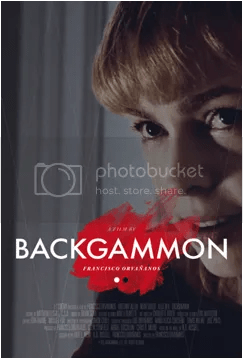 BACKGAMMON is directed by Francisco Orvañanos and stars Brittany Allen (“All My Children”), Noah Silver (“Tyrant,” “The Borgias”), Alex Beh, Olivia Crocicchia (“Rescue Me”) and, Christian Alexander (“General Hospital”).